When you sign up to LTL you aren’t just here to study Chinese. 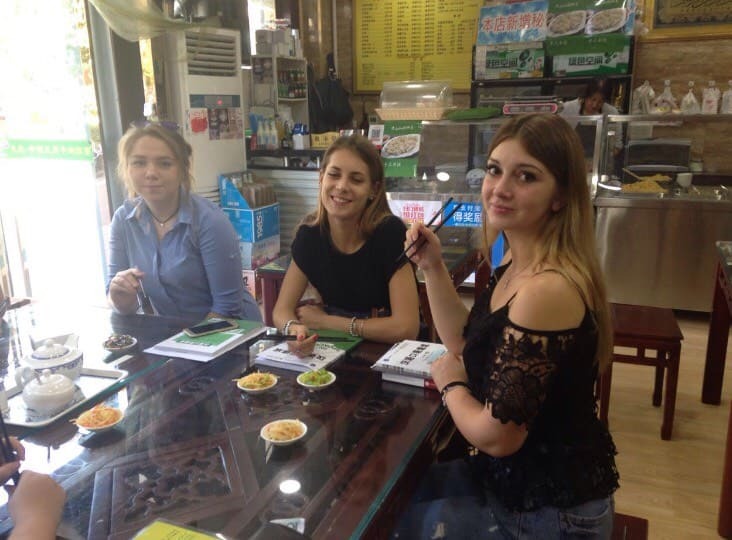 You are here to discover a unique country and you’ll do this with your new LTL Family. We pride ourselves greatly on being a very close community and this runs through our core. Everyone is here for everyone whether you have language barrier issues, need help at the bank or simply want recommendations for Beijing. Also, we serve free beer at our school Mon-Fri after 5pm! Depending on preferences of the group we do this either as a one or two day trip. 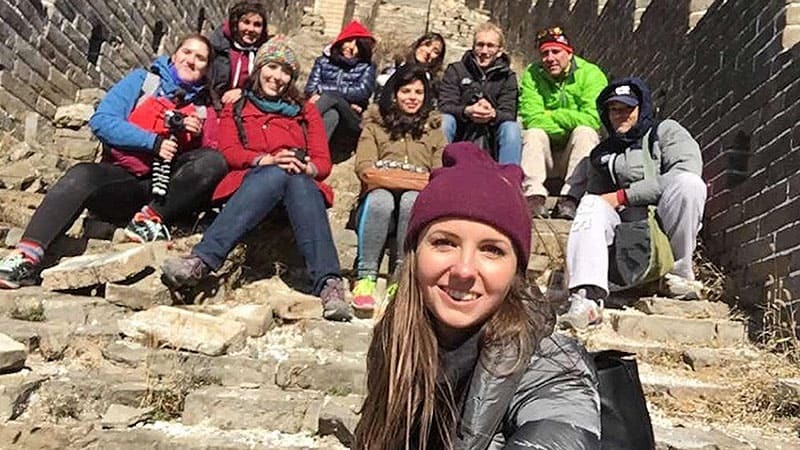 The LTL Great Wall Trip is probably the most popular school trip we do and we offer it frequently. Several sections of the Great Wall have been renovated and opened for mass tourism, with loads of vendors, tour groups, souvenir shops and the like. This is not where we go. We hike along an old and untouched section of the Great Wall with amazing views, completely undisturbed by other tourists. Climbing up an old watch tower that has been sitting there undisturbed for hundreds of years all by yourself is an amazing experience. The pictures you will take will be even more breathtaking. For two day trips we stay in the Chen family farmhouse, have a BBQ together in their yard and explore another section of the Great Wall and the Ming Tombs on the way back on Sunday. We leave early Saturday morning and are back either Saturday or Sunday evening. This includes transport, tickets, local guide, all food and for two day trips, accommodation. The cost can vary a bit depending on how many people go, as transport gets cheaper in a bigger group. Usually it is between four to ten of us going. 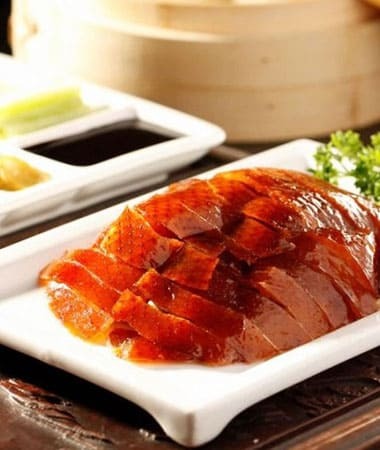 If there was ever a dish that was synonymous with Beijing then it’s Beijing Roast Duck. 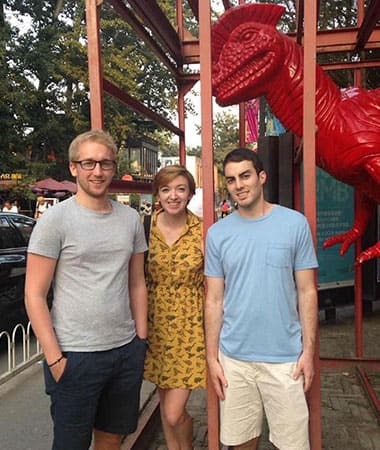 Students can’t get enough of visiting the various roast duck restaurants throughout Beijing. We are spoilt for choice and we sure make the most of it! Whether it’s a more upper class, expensive option like Quanjude or something a bit cheaper the Duck is always absolutely delicious. Cost is usually about 80 CNY per person, depending on how much food we order and where we go. 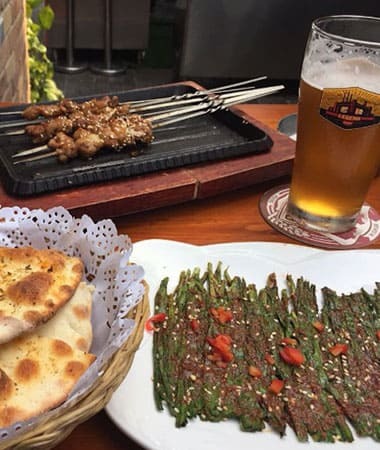 Dinner comes usually with plenty of beer and other dishes. Vegans are welcome to join, as we will also get plenty of greens. We host a Monday welcome breakfast on every Mandarin course starting date of the year to welcome along our newest students. There are normally a few tired eyes and a bit of jetlag around but arriving at LTL school, meeting your fellow students and colleagues then tucking into some traditional Chinese breakfast normally brushes away any of those cobwebs. After a tour of the school and the area we either go for pancakes or jiaozi together. The welcome breakfast is free for anyone who followed any of our international social media accounts before arriving in Beijing. We have a welcome breakfast on all complete beginner group class starting dates. You can find details on our learn Chinese in a small group class page. If possible, we recommend arriving to Beijing on a beginner group class starting date as we have more students arrive on these dates and there are plenty of activities to do. However, if it doesn’t fit your schedule starting your course on any other Monday is also fine. You will meet other students quickly during school lunch and the activities. Name something and there is probably a museum dedicated to it in Beijing, such is the size of this city. We’ve been to a tap water museum before, a museum dedicated to tap water, it really does exist. There is also a Watermelon museum, the Bee Museum and a Police Museum. 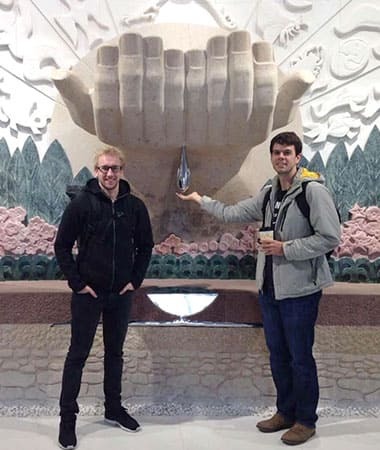 For our weekend trip we often visit one of Beijing’s museums, going to another one every time to make sure that our long term students get to see different ones every time. The cost depends on the museum we are visiting, but tickets are usually very affordable from 10 to 50 CNY. This is a weekend activity. 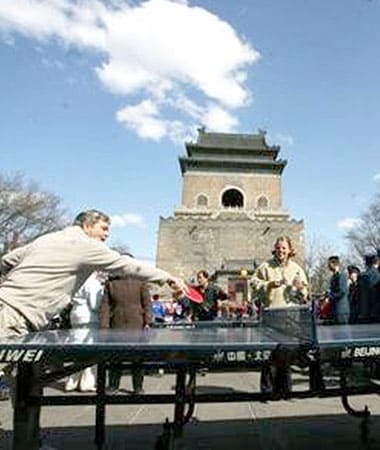 Getting competitive with the locals is a great way to brush up on your Chinese and make more friends. We have a basketball court in our school complex and there is a Chinese university with football and tennis courts just across the road. It is great fun and light hearted generally. That doesn’t stop us from wanting to win though! There are no costs involve in playing sports, but make sure you bring your football shoes or other equipment if there is a particular sport you want to play. Otherwise normal trainers will do. 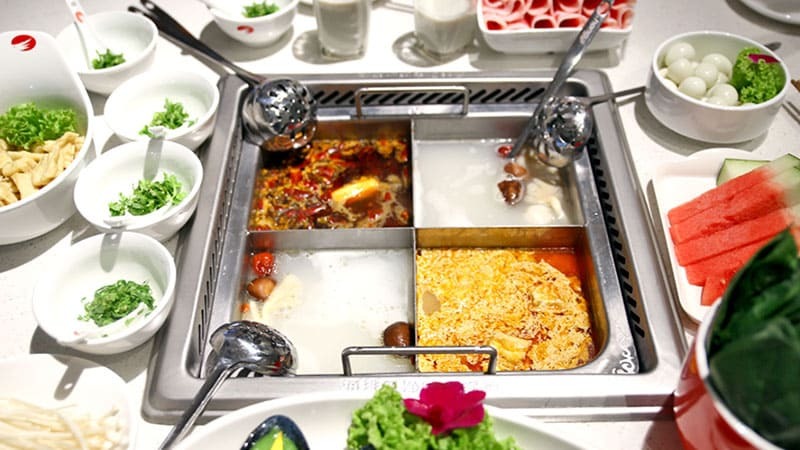 Hai Di Lao Hot Pot is one of China’s most famed restaurants and when you visit you’ll see why. Gorgeous food cooked in front of your very eyes in a number of different flavored soups. However, if you think the food is great, the service is sublime. Always busy, always bustling and a brilliantly social way to enjoy some divine Chinese cuisine. It is about a 15 minute walk from the school and it is a very popular choice for our Wednesday mid week school activity. Watching the “noodle dance” when we are served our noodles is also quite an experience. We share the cost for dinner together, which usually works out at about 70 CNY per person for an incredible amount of food and drinks. The Hutongs in Beijing are a sight for sore eyes. 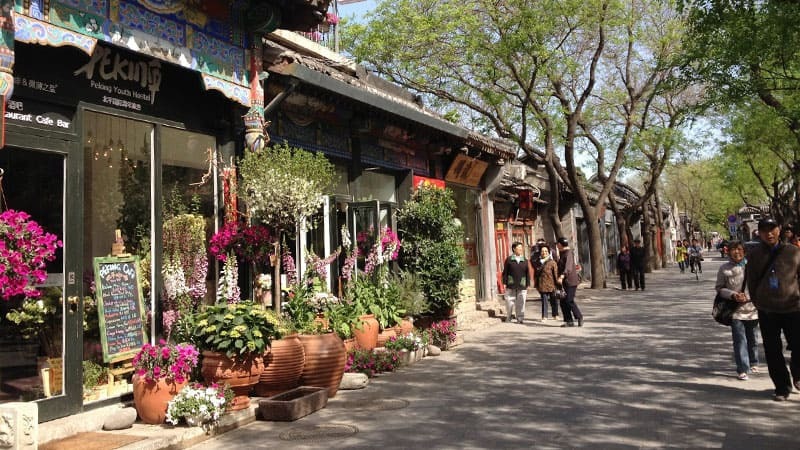 Narrow and tight but there is so much to uncover in one of Beijing’s most famous draws. There are bars, restaurants and markets tucked away down the tiniest of walk ways. Cars, bikes and people squeeze down these narrow lanes with so much to offer and so much to discover. Visiting the Hutongs is free and for lunch we share the cost, usually about 40 CNY per person. 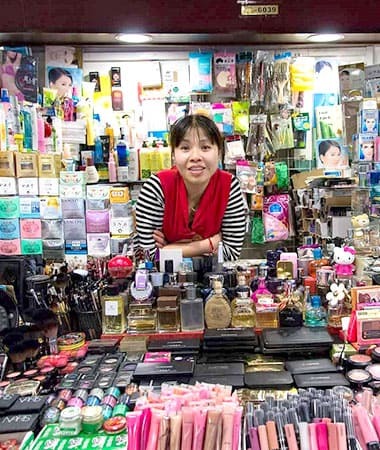 China as a whole is littered with markets that sell anything and everything you could possibly imagine at dirt cheap prices. There are countless to mention in Beijing and the food also must be experienced. There will be some memorable sights along the way so be sure to breathe it all in and enjoy the atmosphere. The most popular and frequent market trip we do is to Panjiayuan, the old Beijing antique and flea market where you can get anything from propaganda posters of the communist area to several meter tall stone Buddhas. The trip is free, but how much you will pay for the things you buy will depend on your bargaining skills. We are of course there to help you with getting the prices down. Pub Quiz is our favourite Wednesday tradition at QMex Bar but Beijing hosts many more throughout the week if this is your kind of thing. This Chinese/English bilingual quiz we go to gets rather competitive every Wednesday night and we send down an LTL team very often. The quiz is well run, and open to foreigners and Chinese with both languages spoken. Oh, their sizable Nacho’s are half price also! Each team gets a free pitcher of beer. Food in China is the best around, we genuinely believe this is true. Every week we like to try something different. We usually rotate between spicy Sichuan food, Xinjiang muslim food and southern Dim Sum, but are always open for special requests. Dinners are usually on Wednesday evenings and we leave together from the school at 6:30pm. Cost depends on how much we eat and drink, but is usually about 50 CNY per person. 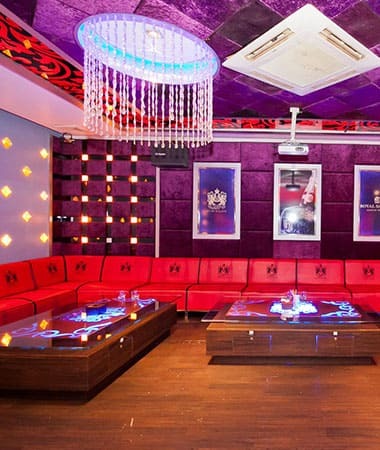 KTV stands for karaoke and is one of the more famed Chinese traditions. Getting together with a group of other students and singing long into the night is a great way to have fun and see contemporary Chinese culture in action. KTV is great fun. The venues are very smart inside and the rooms are fully equipped with everything you need. Both foreign and Chinese music is available. We assure you, this is a great way to spend a night. We usually go for KTV on Fridays as we usually end up signing until pretty late into the night and often move on to a nightclub afterwards. If you don’t know what Bai Jiu is now, you will do once you’ve finished with Beijing. China’s most famous alcoholic spirit is traditionally drunk by Chinese and traditionally disliked by foreigners! Truth be told, once you get beyond the early taste it’s actually quite enjoyable. There are many different flavored variants to enjoy. This is our most popular option for Friday night after school drinks. The cost depends on how much you drink. 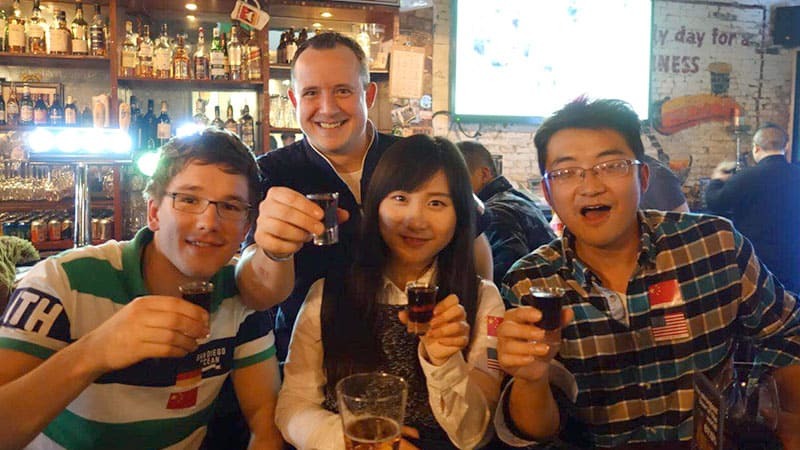 A sample flight of four different Baijiu shots, including a very informative explanation of the various distilling traditions in different parts of China, will cost you 40 CNY. The LTL lunch club runs daily at the school between 12-1pm. 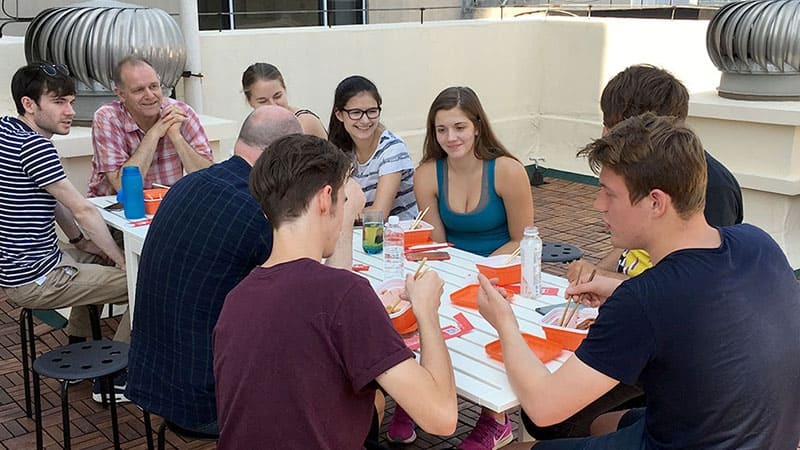 Students have the option to get together in a group rather than exploring the streets of Beijing for lunch. We order the food, you kick back, relax, and eat away. Each day we order something a bit different so you are always trying new things. Cost varies on what we ordered, but is usually about 25 CNY per person. Make sure you sign up before 10:30am. People in Northeast China close to the border of North Korea are of Korean decent and are considered China’s grandmasters of BBQ. Korean BBQ is a cuisine you must try. There are flavours that send the taste buds wild. Food is cooked right in front of your very eyes and whilst your mouth waters. 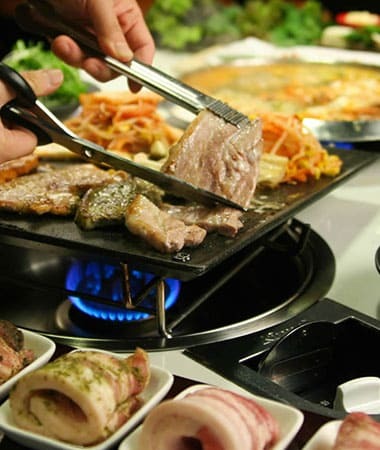 We have a Korean style BBQ place just five minutes walk from the school and this is a popular choice for our Wednesday school dinners. Cost is usually about 60 CNY per person including plenty of food and beer. Dashanzi, also called 798, is enjoying a growing reputation for it’s artistic community and it is not hard to see why. The community started in the abandoned factory buildings of a former arms manufacturing company that was closed down in the 90s. There are hundreds of different art galleries, from exclusive providers exhibiting works from world famous artists only the super-rich could afford to small ones that show the works from young and new local talent. The area is full of little tea houses, restaurants and shops and there is something interesting to be found around every corner. We usually go to 798 on a Saturday afternoon, strolling and then all have dinner in one of the restaurants there. Visiting 798 is free of charge and for dinner we simply share the cost, usually about 30 CNY per person. Should you want to buy some works of hot contemporary Chinese artists though you better bring your credit card. We turn class room number three into a little private cinema after class and watch a Chinese movie together. The movie will be in Chinese but the subtitles are in English so even if your Chinese level isn’t too high you’ll still be able to enjoy. These evenings tend to be very popular with a lot of our students. As we have free beer at the school every day after 5pm and free coffee and tea all day there are plenty of free drinks. We also like to order in takeaway food, this can range from Chinese or sometimes, if we are feeling devilish we like to order pizza’s between us. 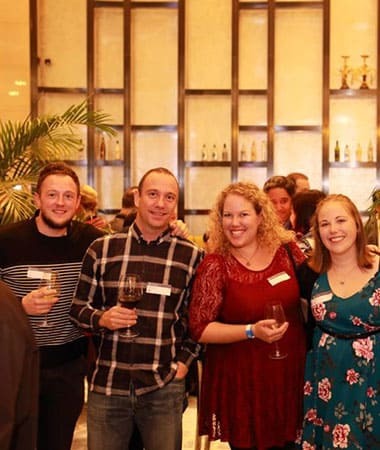 Internations is a networking event that LTL sponsors in Beijing. That means our students get reduced entry fees and we always have a staff member going there. 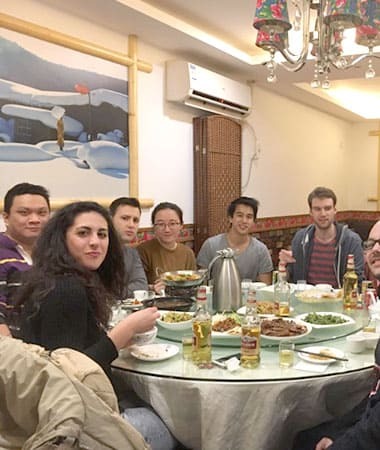 Internations events happen every second Friday and are always at a different bar in Beijing. Often they are very close to our school as we are located right in the middle of the Central Business District, but sometimes we have to take the subway to get there. As our school is located right next to the DaWangLu Subway station where lines 1 and 14 cross this is usually only a short ride though. 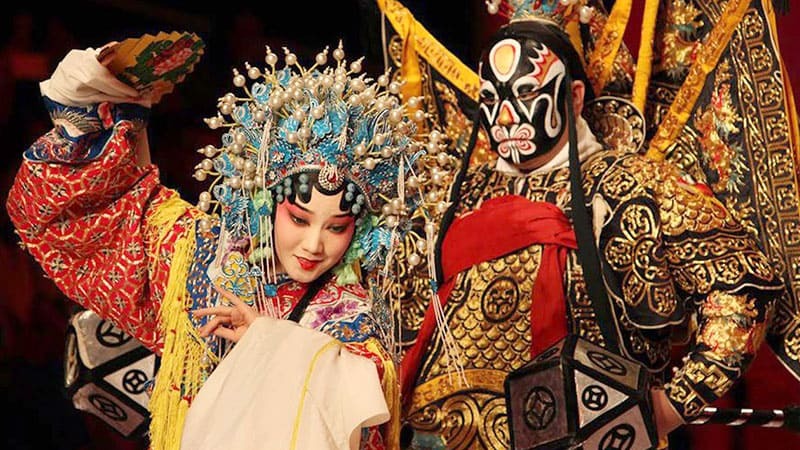 Beijing Opera is a particularly popular event with our students. A performance like nothing from anywhere else, this is the real China at it’s finest. Shows take place in an old Chinese tea house and are an amazing experience. We won’t give too much away but we recommend you come along and enjoy the show. You’ll find our staff approachable every day and that includes your Student Advisor. Our teachers, although hard workers, enjoy joining in with our students for dinner every so often. Everyone has a bond at the centre and this is a crucial reason as to why students always wish to return to LTL. Every week we have two LTL school events, usually one during the week after class that is often dinner, going for drinks or attending a show close by and one on the weekend where we travel a bit farther. In addition, our student community also organize a lot of events together and usually a quick “Who wants to go to the Forbidden City on Sunday at 10am?” in our WeChat school chat group is all it takes to get a group of people together. For all community organized events, we will of course help with the booking tickets, advice on how to get there etc. 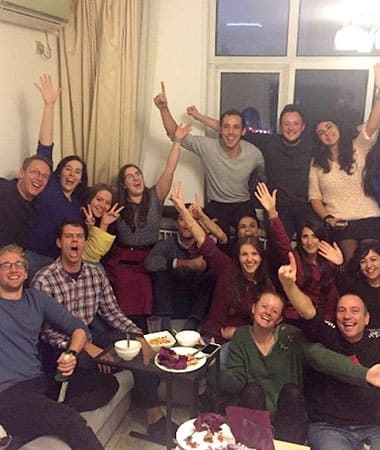 You will make potential friends for life either in your class, or at our social events. Feel free to arrange your own events with your new group of friends and share your stories from China and further afield. Of course all events are completely optional so whether you join or wish to do your own thing and that is no problem whatsoever.